A night at the circus and home in time for the new to Aussie TV Grimm … Yikes so fun and cool – a combo of fairy tales and police detective story! 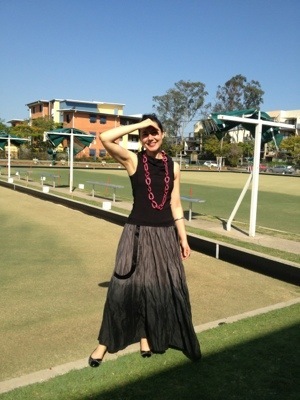 Posted in Brisbane Fun, character outfit, fashion and tagged circus, Grimm, Radio Lollipop, spring, theme night. Bookmark the permalink. 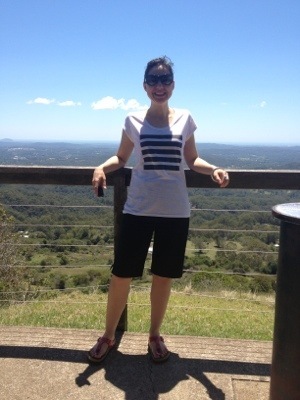 Posted in Brisbane Fun, casual, Esprit, fashion and tagged Gold Coast, holiday, Montville, spring. Bookmark the permalink. 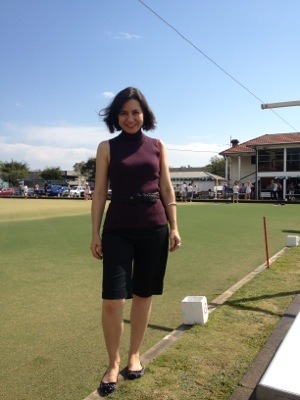 Posted in Brisbane Fun, casual, Esprit, fashion, Sportsgirl and tagged Coorparoo Bowls Club, spring. Bookmark the permalink. 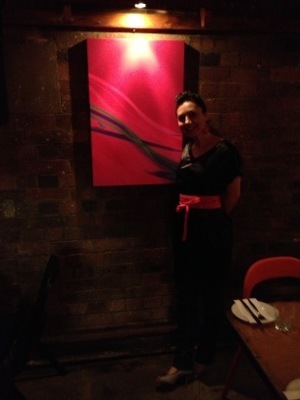 Had dinner at Verve http://vervecafe.com/ to show off my gorgeous boyf’s fab photo exhibition. Gap jeans, Supre obi and my student designer top from uni markets on a background of amazing multicoloured trucks lights on long exposure. 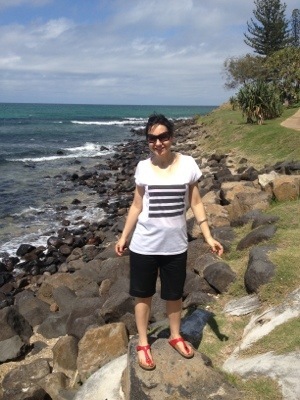 Posted in Brisbane Fun, casual, fashion, Gap, jeans, Supre and tagged Photo exhibition, spring. Bookmark the permalink. Only one thing could accessorise my new birthday pyjama pants and my Bonds singlet – this scrummy toile apron with buttons for little towels and other things you may like to take with you as you clean. This apron makes you want to clean … Talk about the power of fashion! 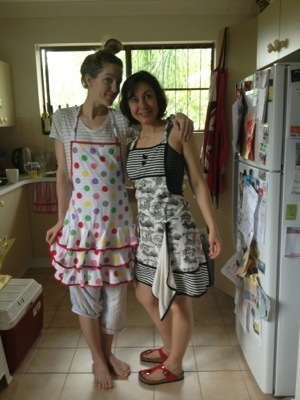 Posted in Birkenstocks, Brisbane Fun, casual, fashion, the power of fashion and tagged aprons, party, spring. Bookmark the permalink. 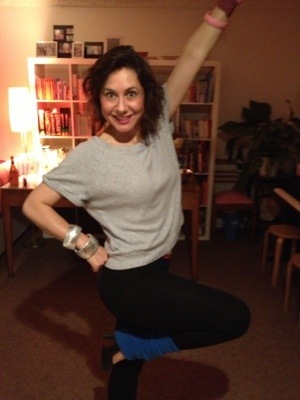 Day 321.2 – What’s your favourite 80s TV show? Fame I’m gonna live forever! 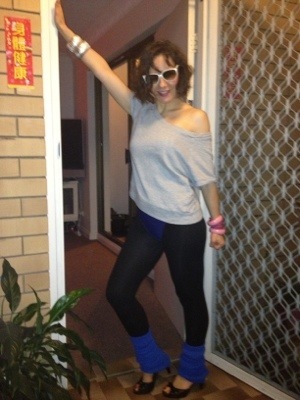 Posted in Brisbane Fun, casual, character outfit, fashion and tagged 80s, 80s TV shows, Fame, spring, theme parties. Bookmark the permalink. Yes, I did choose my outfit purely so I could wear my new necklace! 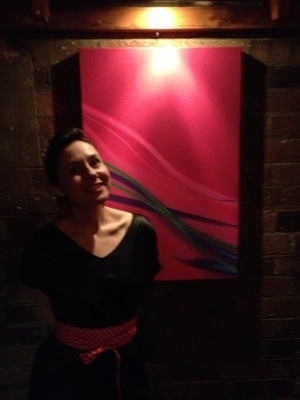 Posted in Aussie Designer, Brisbane Fun, Dogstar, fashion, work and tagged accessories, Birthday, spring. Bookmark the permalink.